Okay, if you pay close attention to the first picture of this post, you'll notice that there is something peculiar. Yes, the red carpet! 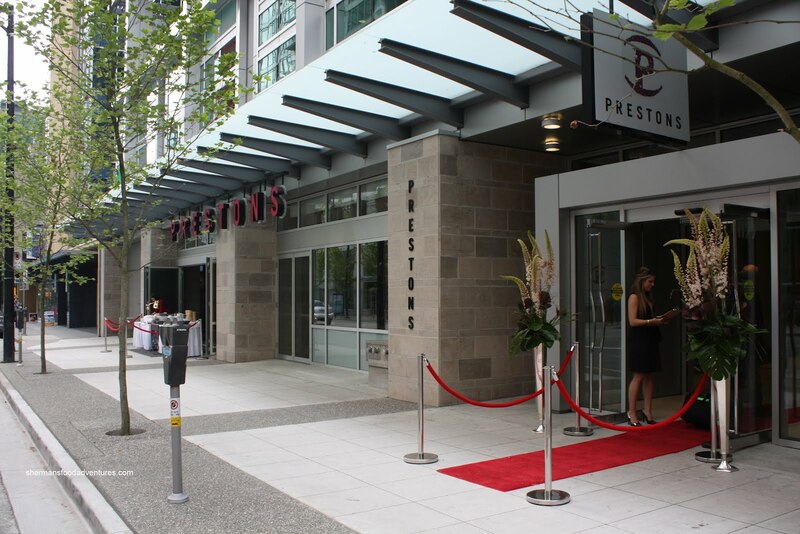 Why is there a red carpet leading into Preston's? Honestly, this picture was taken during the grand opening way back in June 2010. Now, I'm not normally a "grand opening" type of person since it usually involves large crowds and it really doesn't offer up any indication how an actual meal would be like. Now don't get me wrong, I'm not saying grand openings are not important. To a restaurant, this is the best way to create buzz and a splash. We must remember - a restaurant is out there to make money a nd who can blame them for doing whatever they can to promote themselves? In fact, some of their offerings that night were pretty good (some not so much). This prompted me to plan an actual visit. Well, more than one and half years later, the time had finally come. With Whipping Girl, Costanza and Chill, I was ready to tackle some of their grub. 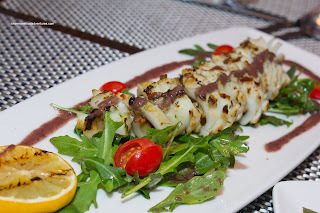 From what I could remember, the highlight of the grand opening was the Calamari. Thus, I had no objections when Costanza wanted to share an order. The grilled squid had the perfect texture - chewy while still delicately soft. 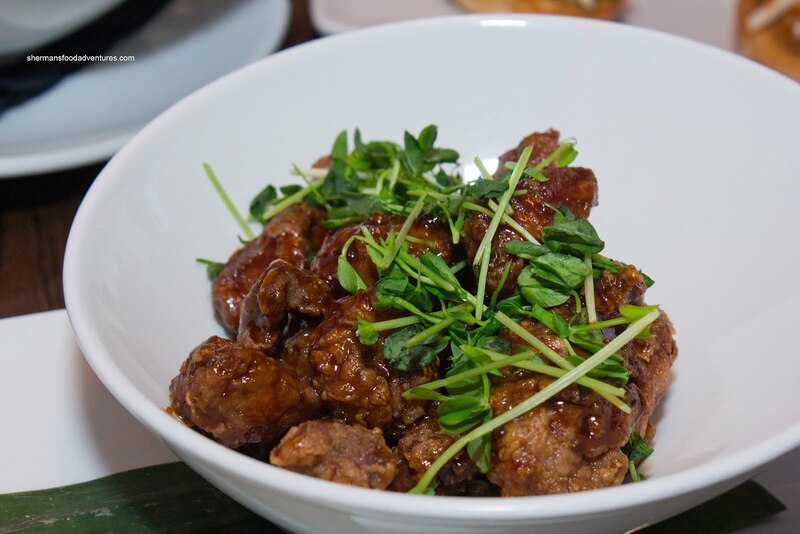 The smokiness of the grill helped add a nice caramelized flavour to the naturally sweet flesh. The accompanying tapenade really completed the dish by offering up a different form of saltiness. This is probably their best dish by far (compared to everything else I've tried). Costanza went for an item he had once before which was the Crispy Halibut Sandwich. 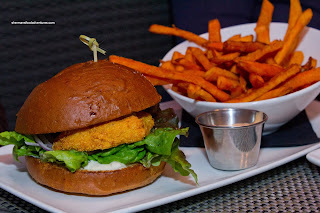 The cornmeal-crusted BC halibut was served on a brioche bun along with tarragon tartar. 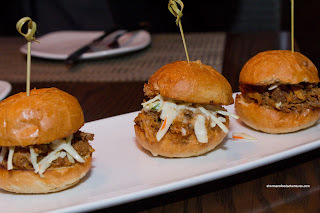 I really liked the cornmeal crust, it was very crunchy and added a nice texture to the sandwich. However, the halibut was a bit dry (even for halibut). The tarragon tartar was not as impactful as we had hoped, but then again, we could've just asked for more. We both love brioche buns, but this one was too dry and combined with the dry halibut, it was not that appealing. We loved the large side of crispy yam fries though. disappointing. The bun was a touch too dry while the meat needed much more BBQ sauce. Furthermore, the coleslaw was barely there, hence, I didn't get a sense of the flavour nor the texture. There were enough good components here to make a good pulled pork sandwich, it just needed some tweaking. The one dish that needed just a minor tweak was the Seafood Linguine. 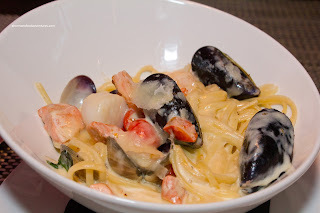 With a good amount of mussels, clams, prawns, scallops and salmon bathed in a white wine cream sauce, shaved Parmesan and fresh basil, all of the components were there to make a good dish. This was especially true with the al dente linguine too. What was wrong then? There was no flavour in the sauce. Sure, it is supposed to be subtle, but it was far too subtle. 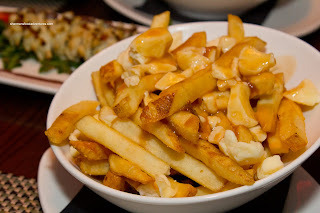 Lastly, we had the Preston's Poutine which boasted Quebec Cheese Curds and Rickard's Red Gravy. Again, there were some good components at play here. The gravy was nice - not too salty, yet flavourful at the same time. The cheese curds were not necessary the type I like, but there was plenty of it and it wasn't offensive. The fries were the weak link though. Too generic for my tastes. If they were more "fresh cut-like", then we'd have a winner. If you have been noticing a trend here, you are right. The food has potential here, considering the decent components. However, we felt a few tweaks were needed to put the food over the top. With that being said, the food wasn't bad. Combined with attentive service and a fancy decor, Preston's is safe place to visit if one wasn't in the adventurous mood.